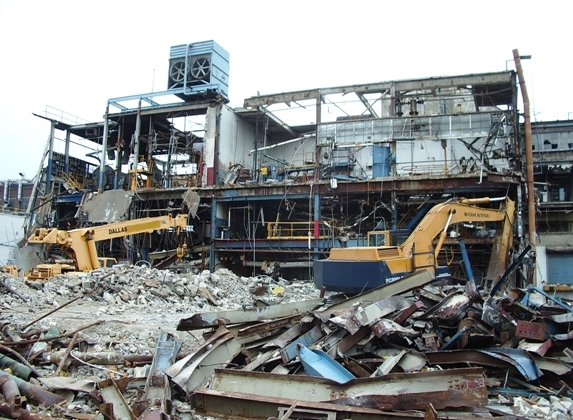 Each demolition project is unique and a site specific HASP and Workplan, along with an OSHA engineering survey must be developed. A brief description of common steps, practices and methods of demolition is provided below. Hydraulic excavators may be used to topple one-or two-story buildings by means of an undermining process. The strategy is to undermine the building while controlling the manner and direction in which it falls. The demolition project manager/supervisor will determine where undermining is necessary so that a building falls in the desired manner and direction. The walls are typically undermined at a building’s base, but this is not always the case as building designs may dictate otherwise. Safety and cleanup considerations are also taken into account in determining how the building is undermined and ultimately demolished. In some cases a crane with a wrecking ball is utilized to demolish the structure down to a certain manageable height. At that point undermining takes place as described above in first paragraph. Loaders or dozers may also be used to demolish a building. These loaders and bulldozers are typically equipped with “rakes” (which are thick pieces of steel which could be an I-Beam or thick steel tube) that is used to ram building walls. Skid loaders and loaders will also be used to load materials out and sort steel.